Nice choice of the Balearic Islands for a bit of October sunshine for a few of the Goalspecific athletes this year. Head coach Fran, looking to finish on a high note for the year was accompanied by Dave Smith, Emanuele Fanti (making his GS race debut) and superfast Steve Wilson looking to cap a year of massive improvement. Meanwhile, Derek was competing in the ETU Sprint Duathlon Championship in Ibiza with an eye on at least securing automatic qualification for next year (after forgetting to enter the qualifiers ). And across the atlantic, Tony was on his way to Florida for the ironman. First up, Mallorca. This is a great race. The start on the beach at Peguera is spectacular and the sea is warm and clear – and to make it even better, they don’t start until 9am! All 4 GS athletes got off to good start with good swims (on a slightly extended course) with Fran and Steve both out in 34mins followed by Dave and Emanuele who’s race would get quicker from there. The bike course is tough but that didn’t stop Steve hitting it hard and he was soon climbing places on the leaderboard towards a top 10 position in his age group. And at last Fran was showing some of her customary bike class quickly moving up into 2nd place and catching ex-pro athlete Jennifer Duffy as the miles ticked down. Emanuele was also flying on the bike and Dave was hitting a consistent pace aware of his lack of recent training. Onto the run and Fran was in transition alongside Jennifer Duffy after taking 5mins out of her on the bike and Steve was already long gone after a blistering bike split. This time though, Steve’ run legs weren’t quite where he wanted them, although a perfectly respectable 1hr35min half marathon was enough to secure a qualification slot for the championship in Slovakia next year – so goal accomplished. Fran is still a way short of her best running form but despite dropping to 3rd for a period of the run was able to muster up an excellent last 5km to run back into 2nd place and automatic qualification. A great performance to finish the year off with. Emanuele’s 2hr45min bike set him up to smash his sub 6hr target with an excellent sub 5.30 finish time in his first ever triathlon (!!) and Dave also finished strongly and made loads of new friends on the run course as he was going! Brilliant results from the team. Onto the ETU sprint duathlon in Ibiza and Derek had an excellent first run followed by posting an amazing bike split that was 2min faster than everyone else in his age group. Not surprisingly he was up to second on the dismount line and on for a medal finish. Unfortunately a rather long transition time put him on the back foot and despite a good second run Derek finished in 5th place – still a massive achievement in the European Championships and good enough for the automatic qualification that will see him back fighting for another major championship medal next year. So the honour of the last triathlon of the year for the GS team fell to Tony at IM Florida although a couple of weeks out it was looking far from certain that the race would take place at all following the devastation caused by the hurricane. 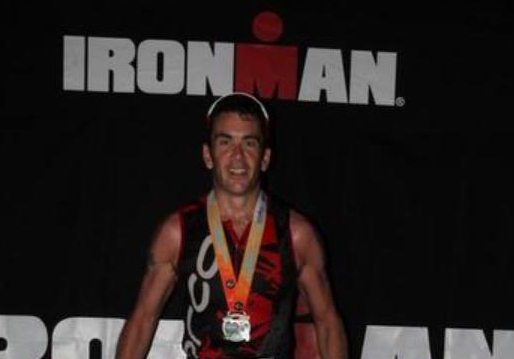 Ironman finally decided to move the event to the 70.3 course meaning that athletes had to hastily rearrange their plans but Anthony managed to get himself there fit and ready to go. Great swim by Tony fuelled by the additional adrenalin that often accompanies alligator filled water (so I’m told) meant that he was out of the water in 1hr17mins and on to the bike where he went to work moving through the field. The structured work is really starting to pay off and a good bike split of 5hr36min put Tony on the run in good shape. By this time it was really hot and this is a big factor in Florida made doubly tricky by the most complicated run route ever. But as time went on Tony just got stronger and it turned in to a really exciting finish watching to see if he could move up in to a top 30 finish in his age group passing loads of athletes on the way – which he did! So 30th place out of nearly 300 – not bad in 11hr13min and we’re quite excited to see what will happen next year after a good winter block.